Well, forget about any other sangria recipe. What follows is the best darn sangria recipe in the world. In a large pitcher or jug, mix all ingredients but the tonic water and the fruit. Refrigerate for a few hours until chilled. Before serving, add tonic water and fruit. Note number one: The original recipe called for 1/4 cup sugar to be mixed in. The first time I made this beverage, I used 1/4 cup simple syrup but found it way too sweet. We like ours without the sweetener. Add it if you like. Note number two: Beware, this stuff drinks like Kool-Aid and can be dangerous. I added the tonic water to cut the lethalness of this cocktail. If you make up a big batch, you can just leave it in the fridge and top off each serving with about 1/4 cup tonic water rather than add the whole bottle. Note number three: Garnish with whatever fruit you have. 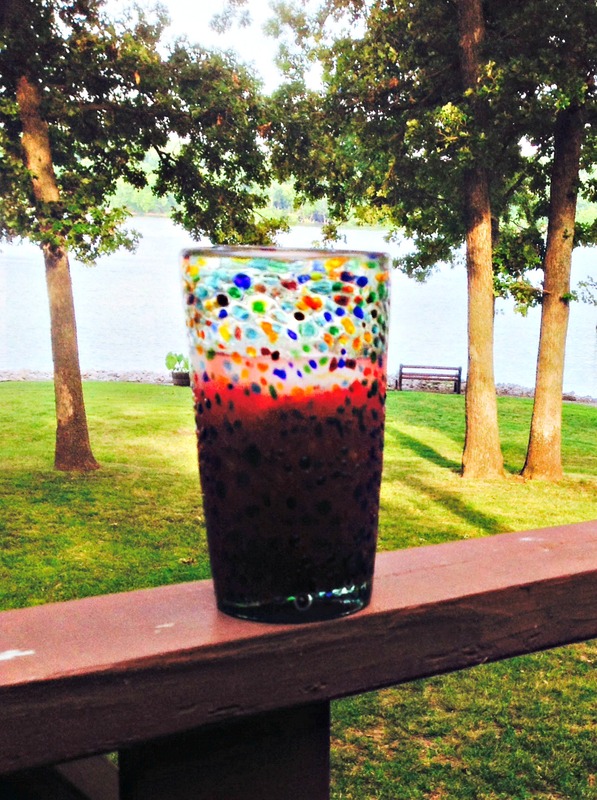 Frozen fruit works well in sangria. The original recipes states to garnish with orange slices and cinnamon sticks. We used fresh peaches and grapes. A cheap red wine for an ingredient and a beer pitcher for the serving vessel. Hey, we are at the lake. Note number four: This, again, is the best darn sangria you will ever have the pleasure of sipping. The key word here is “sipping.” You will want to gulp this down by the glassful on a hot summer afternoon. Refrain and remember that moderation is the key. Note number five: I am going to archive this for future use during the winter, leave out the tonic water, and serve this hot as a mulled wine, adding a cinnamon stick for a garnish. I made a batch of this nectar for our Fourth of July cookout and made another batch for us at the lake. It was delicious sipping this during the evenings on the back deck watching the fish jump and the ducks swim by. Totally refreshing! Bet it would be great to make a white version with some Tuscan whites too. Have a relaxing and beautiful weekend, Debra. Yes. I was thinking that too, but the vermouth might make it a bit cloudy or darkish. 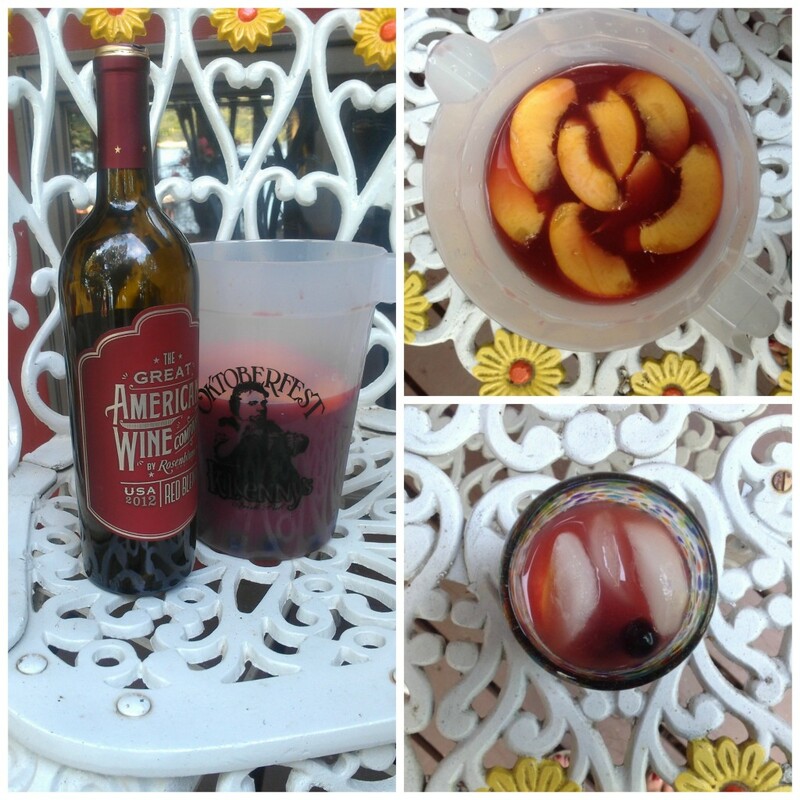 I have a good white sangria recipe that I should mix up and post, too. Sangria cuatro. Yeah, you have to beware of those yummy drinks that you can down like kook aid! You are in trouble before you know it. Perfect for sipping lakeside. Adding the tonic water is a great idea for parties. It stretched out the batch plus made it more sip-worthy for the fourth. Haha, that does sound like the best darn sangria recipe! And how inspiring is that photo in the beautiful outdoors with the view of the lake… love! Just watched the video too… I’m feeling very serene 😉 thank you! Hope you didn’t notice the voice from next door that was directing some renovations. Hahaha. It was serene until then.